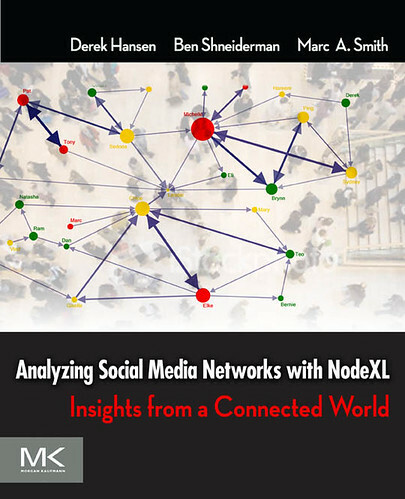 The book Analyzing Social Media Networks with NodeXL: Insights from a connected world is now available [Amazon] from Morgan-Kaufman. 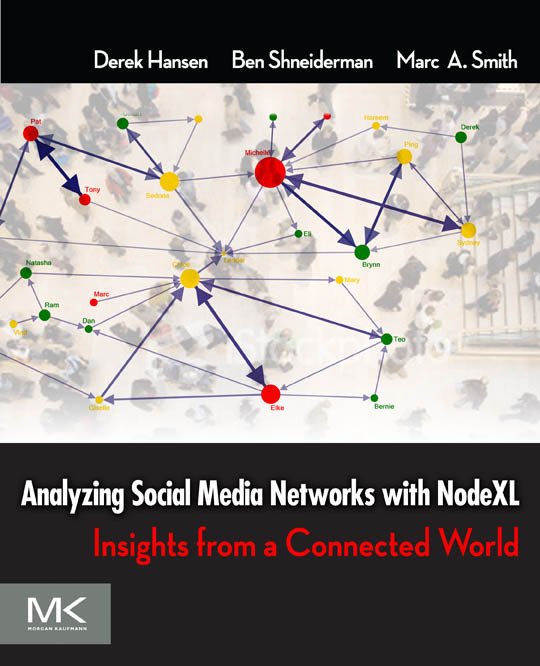 Co-authored by Professor Derek Hansen (College of Information Studies) and Professor Ben Shneiderman (Computer Science/Human Computer Interaction Lab) from the University of Maryland and Marc Smith from Connected Action, the book is a introduction and guide to the application of social network analysis to social media. The introductory chapters introduce the history and concepts of social network analysis an the varieties of social media, highlighting the presence of a common data structure, the network, in otherwise diverse social media systems including email, Twitter, Facebook, the WWW, Wikis, Blogs, flickr, an YouTube. The central section of the book reviews a step-by-step guide to using the key features of NodeXL, the free and open social media network analysis add-in for Excel 2007 and 2010. Readers can move from simple hand entered networks of a few nodes up to complex graphs extracted from a variety of social media services. The remainder of the book are focused chapters dedicated to analyzing the networks found within a specific social media service. These chapters were contributed by leading social media researchers and illustrate the insights that can be extracted from the otherwise disorganized stream of messages, tweets, posts, comments, links, likes, tags, friends, follows, mentions, replies and ratings. A recent article about the book can be found on the Morgan-Kaufmann website. 2010 – June – NodeXL Book Flyer. [Chapter 10]: Twitter: Conversation, Entertainment and Information, All in One Network!